This is one of my best sellers here at the nursery for those shady places. It grows well on North facing sites and puts out an outstanding shower of 6-7” bi-colored Pink flowers. It was bred then named by Bees Nursery to celebrate their 25th anniversary. Bees’ Jubilee has received the RHS Award of Garden Merit. These plants are very large and full of roots! Betty needs to be in every garden! 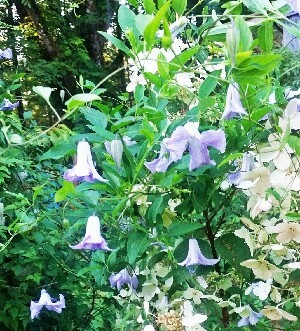 Pale pink nodding bells edged and veined in darker blue-mauve. It will cover your arbor in short order. Often a sweet scent is also noted. Very free flowering.A must have. Discovered by Mrs. Elizabeth Corning the wife of Erastus Corning II who was once the Mayor of Albany, New York. Thought to be a hybrid of C. crispa X C viticella. Also known as “Blekitny Aniol”: A beautiful Medium to Large Blue flower with wavy edges that has a pink cast, Creamy white filaments with light yellow Anthers. Free flowering.Looks great grown with a dark purple clematis like Etoile Violette. Blue Ravine has been admired in my display gardens for many years. The flowers are large and showy with a tinge of fragrance. It is hardy, free flowering and seems to be very happy in a large pot. 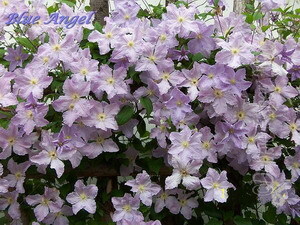 It changes many colors during the bloom cycle making the appearance of having more than one clematis in the pot. 2019 is the first time I have offered this one for sale. 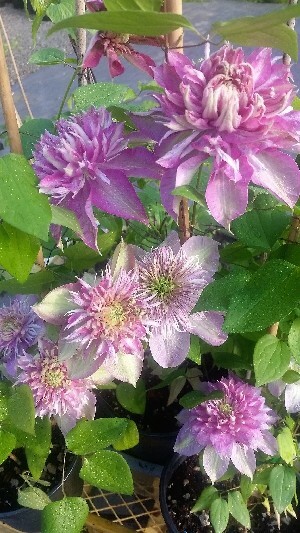 Kaiser is a beautiful Japanese clematis with large Double Pink Flowers of many shades as well as many forms. The first flowers I saw on this clematis were very dark deep pink. Many think it is Crystal Fountain, others have thought it was a strange Josephine. For more info and pictures please see the link below to the wonderful nursery of Szczepan Marczynski's nursery in Poland. Stunning bright Red Flowers with a yellow center. This one is a beauty and a Great performer!Does well in a container also.